Before the excruciatingly boring 5-hour drive east across the state and then south toward Metro Detroit, I decided to check out Sleeping Bear Point Hiking Trail near Glen Haven. I anticipated spending around 2 hours completing the 3-mile loop because I wanted to take my time, enjoy the sun before it became too hot, observe some of the plant life along the way, and spend as much time as I pleased taking in the expanse of water and sand. I arrived at the trailhead around 9am to find a surprisingly empty parking lot. This made me exceptionally happy because I am rabidly anti-social and dislike uncomfortable chit chat with strangers especially if they are accompanied by annoying children. Stepping out of my car, I helped myself to a generous dollop of sunblock and headed over to read the informative sign erected by the park service at the start of the trail. What’s this? I’m a visitor in Cougar Habitat? It’s true there have been rumors of large cats in various areas across Michigan, but surely the odds of actually seeing one are slim. What does the park service say about this? This is ridiculous. 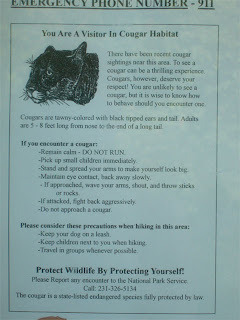 There is no way I’m going to encounter a Mountain Lion on a sand dune next to Lake Michigan. I will just stuff my pockets full of rocks as a precaution (ensuring that I will have weaponry while at the same time weighing myself down so that it will be harder to run away which is a very bad idea according to the sign) and have a nice walk. Perhaps at a bit more brisk a pace than I originally planned, but the exercise will not kill me. Neither will a cougar. That’s just stupid. 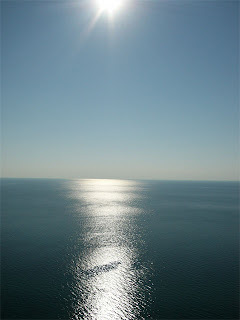 The day was glorious along Sleeping Bear Dunes National Lakeshore. After walking a short distance along the first stretch of the trail, I found myself on top of a dune looking out toward Sleeping Bear Point. I observed North and South Manitou Islands to the north across the quiet water of Manitou Passage. Stretching out endlessly to the west, the expanse of perfectly calm blue water reflected itself back into the perfectly clear blue sky. To the east a beech-maple forest provided innumerable places for cougars to hide and stalk my solitary progress. 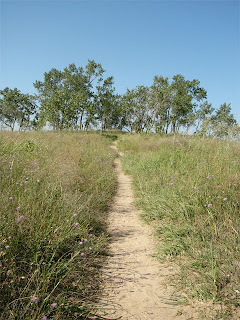 I turned and headed southwest along the trail, following the rise and fall of the hilly landscape. Ahead in the distance I spied what appeared to be a cluster of sticks that someone before me had jammed into the sand to stab at the sky at various angles. Was this some kind of message? A warning to trespassers on this land to venture no further? If I grasped a couple of rocks in my trembling hand as a precaution, I would rather not say. Approaching the sticks with caution, I soon realized they were much bigger than early observation suggested. 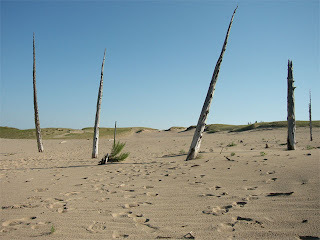 They were, in fact, a ghost forest. At some point this whole area had been covered in woods, but centuries* of blowing sand blasted and eventually buried the trees. 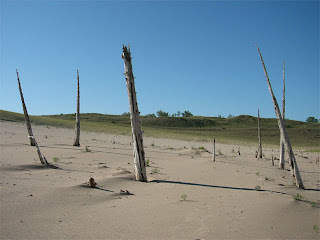 Inevitably the sand moved along and a few skeletons were left standing like lonely monuments along this stark and desolate lakeshore. I mean desolate in a very beautiful way and I stopped to take in my surroundings. It was deafeningly quiet and a bit eerie, an alien planet blanketed with sand. Hills and valleys rolled away in one direction, a mirage of water in the other, and right in the middle stood this handful of ghostly white towers. Memories assailed me of a nightmare I once had involving a Roman colosseum and an unfortunate man’s demise by man-eating lion. Suddenly the beautiful ghost trees loomed and intimidated and felt again like the warning I originally mistook them for. I decided it was time to move on. An edge of forest waited in the distance on the other side of a valley of sand and some gently rolling grassy hills. The trail markers suggested I proceed in that direction so I did as they bade. After a half-mile or so I approached the shade of the woods and immediately heard the dreaded sound of a twig snapping. If there is one thing at which I feel I would truly excel magnificently if given the opportunity, it is blind panic. At last, my shining moment! Preparing myself to flail and scream, I spun around wildly looking in all directions, anticipating attack but seeing nothing. Is this what people trekking across the Sahara feel? Suffocating isolation and fear of some deranged sand creature showing up to aggressively dine on them? No escape because there’s nowhere to go and your ineffective body is weighted down with predator-repelling rocks? I lurched into the forest with determination to finish this haunting experience. I calculated that I was roughly halfway through the trail loop and would arrive at the safety of my car in about an hour. For the second time in as many days I wondered why I did not have the foresight to bring my dog for company. Unfriendly noises assaulted me from all directions. A large bird swooped in from above my head to land in a nearby tree, thus directing my attention to the upper reaches of the forest, the perfect spot for a cunning feline to launch an attack maneuver. It seemed the trees themselves were mocking me with their patronizing stature and murmuring leaves. Where are the other hikers? Oh, how I would welcome delightful conversation with new acquaintances and their endearing children! Clearly what one needs in a situation such as this is an emergency cyanide pill. As I speed-walked past menacing logs and rustling underbrush I wondered if there were secret back rooms at select outfitters where one could procure such an item. With a secret handshake or password of some kind, those who are “cool” are escorted through a hidden passage to a secret darkened VIP room where items of a sensitive nature can be obtained at a price. Later, the credit card statement will read: “Topographic Aid”. Oh dear God! Is that some kind of structure up ahead? Perhaps I can seek refuge inside and wait out the pursuing storm of bloodthirsty Death Cats. Surely someone will come along eventually and I will be rescued! I thrashed through the branches toward this vision of salvation and stumbled out onto the pavement of the parking lot. The safe haven was actually the trailhead outhouse and I found myself staring at my car. Well now I just felt foolish and cheated out of my leisurely 2-hour stroll, which had been condensed into a sweaty 1-hour battle of survival. I was tempted to immediately do the whole thing over, taking my time now that I was an accomplished veteran. However, the parking lot showed evidence I was no longer alone and once someone has been through an experience as harrowing as this, it is difficult to relate to the common citizen. What I needed was solitude. Somewhere between Traverse City and Kalkaska, with the threat of grisly death but a memory, I stopped to buy a quart of cherries and a peach pie from a roadside farm stand and tried not to eat all of it during the remainder of the drive home. *Those who lean toward Intelligent Design may ignore this brazen use of logic. Wow, that place looks amazing. And I think we've come awfully close to it in our travels without stopping in. Must remedy that. I am sorry I didn't get your name, but I just had to reply to your story. I had such a good laugh reading it! because I knew exactly how you felt as I read it. I had the very same experience last September when my husband told me of the fond memories he'd had hiking the dunes to the lake front on a vacation with his parents as a kid and he wanted to do it again some 40 years later with me. What could it hurt? 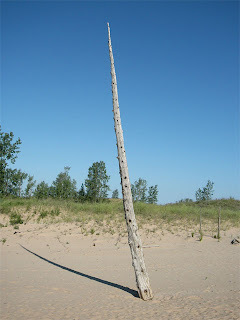 After I read "THE SIGN" re: cougar habitat I grabbed the first thing I could find, a huge 10ft stick. It was charred on one end so my hands were black at the end of this hike, ......My husband said you're not going to carry that thing are you?? no kidding I'm 5'4 and lugged this thing about a mile to the water front, think it weighted 40lbs. but it felt light as a feather.Must have been all that adrenaline. Didn't help when I saw someones shoe laying along the trail. NO lie. Someone's shoe. And alittle bit farther along someones shirt. Never did here of a person that had been eaten by a mountain lion, but it wouldn't have surprised me one bit. I was so scared that whole walk......even saw these HUGE tracks when we got to the water front,very eerie......DOG tracks my husband said.then I saw the look in husbands eyes and I really got scared. I also lived to tell this story. I thought it was a bad dream until I read your story! Oh my gosh was I scared out of my wits! and reading your story brought it all back! THANKS for the memories, loved it. Please stop in to see me if you ever get to the little town of Grabill, IN. I run the little general store there "H. Souder & Sons. I'd love to swap more stories about our hike and have a good laugh! Beth Krohn. Got my interest as soon as I read: dislike uncomfortable chit chat with strangers especially if they are accompanied by annoying children.